With the backing of an anonymous donor, the Highpointers Foundation has created a Donor Recognition Program. Working with the Geo Junga Company of CA, we have created Magnets and Medallions to honor all donors. The Foundation has defined the following levels of support. At the end of 2018, the Foundation had over 195 individual donors. Fifty five of these were at the Katahdin Level, or <$100, another 70 were at the Elbert level, or <$500, 30 were at the Whitney Level, or <$1000, and another 40 were at the Rainier Level, or <$10,000. 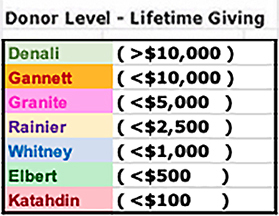 The Foundation has three wonderful donors who have achieved the status of Denali Level, or >$10,000 of lifetime giving. Click Donor Hall of Fame, to see these individual donors. The magnets are silver and gold in color, and look great on a refrigerator door. The medallions are the same size, about 3” in diameter, but they are made of thick heavy metal and come with a display stand. They are made from brass, and come in silver, gold, and polished platinum finishes. They are similar to the replica benchmarks that are sold by several sellers, but ours are custom made for the Foundation. The Foundation thanks Jerald Richardson at Geo Junga for his generous donation of much of the project cost. An anonymous doner made an additional donation to subsidize this project. We used no Foundation General Fund money for this Donor Recognition program. These magnets and medallions were mailed to donors beginning in December, 2014, and continues as new donors come on board and existing donors increase their lifetime giving to a higher level. If you are uncertain of your giving status, we can advise as to your lifetime giving amount. People who are close to the next level are alerted in their letters that accompany the objects.